New Speculation and New Worries - Who Can Save Us Now? 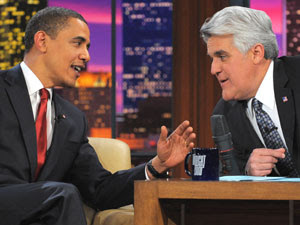 President Obama made history last night as he became the first active President of the US to be on a late night talk show, in which he made a visit to The Tonight Show with Jay Leno as his last stop in California. Once again he was quick to describe his disgust for the corruption of Wall Street and the greed of executives. However, he was quickly able to shed that problem onto Tim Geithner, as he kept referring to them as "his" or "Tim's" problems. Good job Obama, I would be doing the same thing in this mess. After more than a week of rallying, we have now had two days straight of downward trading. Both days being led down by, once again, financials. This is why I did not get too excited to excited to jump into banks after Wednesday's Fed announcement. For even though it looked good on paper and sounded good when it was announced, the consequences of such a move that was and is being made by The Fed, is something our children will also assist in fixing. To take such extreme measures as printing/taxing multiple trillions of dollars for the sole purpose to write off debt that has no intrinsic value, but is just air and numbers on a paper, will be devastating to the economy. It may take a bit for this to come full circle, but in my opinion, we will definitely see it. So for me, I am remaining distanced from banks for the time being and will most likely be ready for a full entry of short for banks very soon. The recent slaughtering in Treasury interest rates have actually sped up the deflationary process a bit, believe it or not. So the storm is very near in my opinion. Also, having the S&P trading at 13 times its earnings is not very reinforcing that we've reached bottom. That is a very high number for these times. In this type of environment, it's hard to pick stocks to go "long" in, as I feel most, no matter how strong a company's balance sheet is, are vulnerable to being dragged down in this market crash. However, the most healthy companies in this type of market are those that are very cash liquid. Cash is king right now. Today, Treasure Island of Las Vegas was sold by MGM to a buyer for $775 million. That sounds like a lot of money for some, depending on which market you live in, but is a huge steal for the Las Vegas Strip, considering Treasure Island's rooms were just recently upgraded and their location is center right on the strip. A much more worn down hotel, in a worse location on the strip was sold in 2007 for $1.2 billion. The reason why the buyer of the deal was able to get Treasure Island at such discount is because they had $600 million in cash to put down on the project, in which the rest was financed in a 36 month carry from MGM. Being that MGM is in a heap of debt from their newest project, their problems became someone else's opportunity. The point is, in this market, cash is king, and those companies that are prepared with liquidity, will make a killing the next few years. For some, generations of wealth will be created from just the actions of the next few years. Like I said, I believe everyone is vulnerable to more downside risk, especially if we reach numbers that I believe are coming for the Dow and S&P, but I would also expect some of the companies mentioned above to make some big, critical moves during this time to position them even better in the years to come. So keep an eye on them, and if you're looking to close your eyes for the next few years, and put something in your IRA or 401K, you may want to consider some of the above. SRS and FAZ enjoyed very large gains today, which I was able to reap with my FAZ call options. However, once again I waited too long for SRS. I still think there is risk for more price slashes to both of these stocks, so I am not loading up quite yet on them. As I said yesterday, GS has been on my radar for shorting for quite sometime now. Due to the ties that GS has with AIG, their stock has been appreciating, mostly based on the government aid that AIG has received. However, with more problems heading towards AIG, that will most likely reflect back on Goldman's stock price as well. You think it is any coincidence that Ex-Secretary Paulson decided to bailout AIG, when he used to be the Chairman for Goldman Sachs? I believe his retirement is doing much better than others. This is just one example of some of the corruption that has been going on for years now. I still don't think we're out of the woods yet for this bear market rally. If we continue to see some more downward pressure on trading, my position could swing, but as of now, I still believe there is enough technical support to keep us going a bit longer. However, financials may be sluggish. They're in a league of their own these days. For those looking to trade options, like myself, Zecco.com offers some of the best per contract prices I've seen out there. Worth checking out. I hope everyone has a good weekend. Next week should be another exciting one. We should expect more news from the government as spending is definitely on their mind. Happy Trading! What is or have your target buy in prices for SRS and FAZ changed since the run up ? Well FAZ is lower but SRS got some serious steam behind it w/SPG issuing stock to get rid of debt. Still sitting in cash and wanting to go short just not sure of when to start building positions adnd at what price? Oh BTW great posts as usual ! Will this matter for next week? What about the uptick rule and M2M? Looks like the Bulls will run next week. Or maybe a lot of short covering... Any thoughts?? I think you meant $775 million, not billion. While we may be in for some hyperinflation at some point in the future, but I think 775 BILLION for Treasure Island is a little early. Similar issue with MGM having 600 billion in cash. Perhaps you mean millions? Bene reading your blog for awhile, and appreciate the comments. I especially liked your roundup tonight on cash liquidity. Definitely made me stop and think for a few minutes. I don't use "entry points" as much for the etfs as I do normal stocks. I more base it on the momentum on the market. Sure, I do factor in the price, but it's a bit more of a complicated decision for me. However, I think if we see SRS dip back in the 50's, its prime picking for me. Faz may hit around $30 again. I'll know more by next week most likely. Thanks for the continually awesome posts! FF what's your opinion on the Geithner plan? Are you going to post again this weekend? I am getting ready to load up with shorts on JPM. With so much exposure to credit cards, commercial real estate, prime residentital real estate, they will be the next major one to go down. Google cash : Yes, Google cash is the answer to all your problems, The real cool thing about google is that you can earn part time income with very little effort. Its going to take more than a sweet talker to fix things.